Explanation: What's happening on the surface of Saturn's moon Enceladus? Enormous ice jets are erupting. Giant plumes of ice have been photographed in dramatic fashion by the robotic Cassini spacecraft during this past weekend's flyby of Saturn's moon Enceladus. Pictured above, numerous plumes are seen rising from long tiger-stripe canyons across Enceladus' craggy surface. Several ice jets are even visible in the shadowed region of crescent Enceladus as they reach high enough to scatter sunlight. Other plumes, near the top of the above image, appear visible just over the moon's sunlit edge. 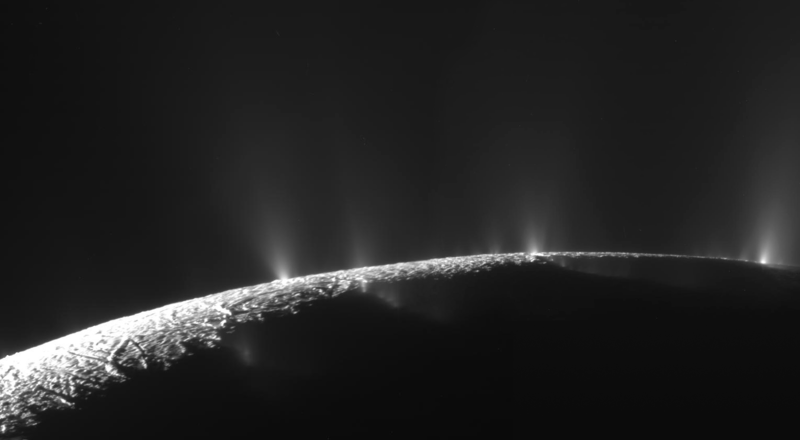 That Enceladus vents fountains of ice was first discovered on Cassini images in 2005, and has been under close study ever since. Continued study of the ice plumes may yield further clues as to whether underground oceans, candidates for containing life, exist on this distant ice world.